After reading a review of the Monk’s Cafe Flemish Sour Ale by our friend Don of the Beer & Whiskey Brothers blog, I knew that I had to eventually try this beer. And the fact that it has the Monk’s Cafe name on it (you know, that world famous Belgian beer bar in Center City Philadelphia? ), made me want to try it even more! In 2002, Tom Peters (owner of Monk’s Cafe) had the opportunity, and the courage, to convince the Van Steenberge brewery to bottle its famous ‘BIOS – Vlaamse Bourgogne’ under private label for him. The Flemish Burgundy of the Van Steenberge brewery is an OLD BROWN in style, aged in oak, and is one of the oldest brews made by the brewery, at least brewed for over 300 years. Tom Peters knew the beer since long, but had always trouble to find some bottles, even in Belgium. Indeed, the beer is only brewed once a year. A final tasting of a whole line of Belgian Old Browns in the Brugs Beertje bar (Brugge) tilted the decision: this is the best Old brown ale in the world! And Tom went to the brewery to see Mr. Paul Van Steenberge and Mr. Jef Versele, the owners of the brewery. Appearance: Ruby red color. Big, fluffy fast rising head that eventually settles down to a half inch high, creamy layer of foam. Lots of sticky lacing forms as you drink it down. Aroma: Sour cherries. Greek Yogurt. Reminds me of a fruity red wine (think an Italian Lambrusco or perhaps a French Cotes du Rhone). Taste: Very well carbonated with lots of tiny, fizzy bubbles that tingle your tongue. A delicious balance of sweet and sour flavors from beginning to end. The experience is sort of like drinking a sour cherry pie or a strawberry rhubarb pie. Very dry finish with a moderately tart and mouth puckering aftertaste. 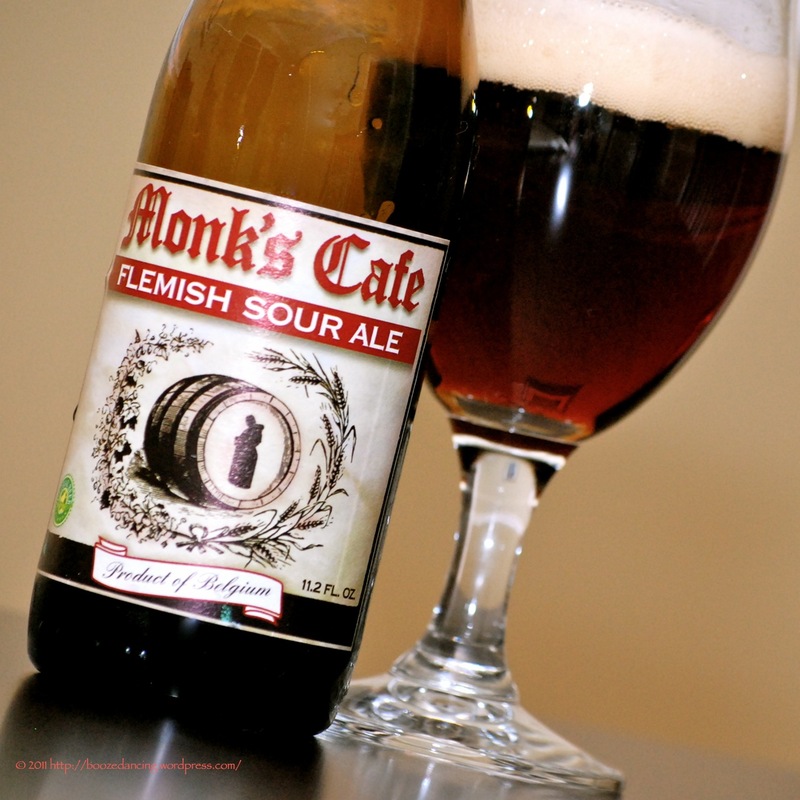 The Monk’s Cafe Flemish Sour Ale is a great beer from start to finish. I drank this beer over the course of an hour, and it actually improved as it came up to room temperature. I totally agree with our friend Don. This is a beer that would pair well with a big, rich meal, or at the very least, a plate of creamy cheeses and charcuterie. I think I know what beer I’ll be bringing to the In-Laws for this year’s Thanksgiving dinner. Oh wow! Excuse the drool. Have you been to Monk’s Cafe? And if so, you thoughts? Several times! Besides having very good food, their Belgian Beer selection is out of control. And they have oodles of American Craft Beer too. My only complaint is that it’s a bit too cozy on most night. Check out PhillyTapFinder.com for their current beer list. Crazy good stuff! I’ve never tried a sour ale. “Sour” doesn’t sound yummy, but since you describe it as “tart,” I kinda’ wanna try one. Tart is definitely a better way to describe. As I said, it reminds me more of a fruity red wine than anything else. I really enjoyed it and hope to try it with Thanksgiving dinner. This beer made me happy. Does it get any better than that? Where did you happen to find this in the bottle? SInce I live in South Jersey and work in Philly, this beer is actually pretty easy to find in my area.